MicMol Smart LED Aquarium Light, Aqua Air AA-1200 Marine 96W, 4860, Programmable Timer Sunrise Sunset Full Spectrum for Saltwater Marine Coral Reef Fish Tank. AA-1200 96W Only 11mm (0.4), Super thin Smart led aquarium light fashion design and great for saltwater marine reef coral LPS SPS fish tank. Super bright LEDs, the real HD full spectrum building 7 bands which comes colorful spectrum of spectral combinations to fit your tank. Smart Controller with timer, sunrise, sunset, lightning, 3 channel adjust intensity with 6 timer points, touch switches easy to control. Adjustable super bracket, good for rim and rimless fish tank, Brackets Suit for tank size: 1185 1685mm (47" 66"). UL, Rosh, CE, SAA Certification Power Adapter, safe and efficient. 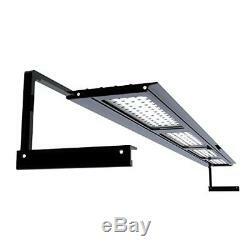 New Aqua Air Lighting The newest Aqua Air LED aquarium lighting is combining the cool smart controller, 11mm super thin unibody design. Power of 24W, 48W, 72W and 96W for choices, great for reef and planted tank. Aqua Air 1200 Item No. AA-1200 Power: 96W Size: 1160X126X11mm Weight: 3.0kg Packing: 1400x170x50mm Marine: 80pcs White - CN 1 32pcs Royal Blue - CN 1 112pcs Royal Blue - CN 2 8pcs Blue - CN 3 8pcs W White - CN 3 8pcs UV - CN 3 4pcs Red - CN 3 4pcs Green - CN 3 Planted: 112pcs White - CN 1 80pcs White - CN 2 32pcs Royal Blue - CN 2 8pcs Blue - CN 3 8pcs W White - CN 3 8pcs UV - CN 3 4pcs Red - CN 3 4pcs Green - CN 3 Bracket Dimesions (length): Min tank: 1185mm Max tank: 1685mm Lighting Features All aluminium modeled body design High quality 0.5 watt SMD LEDs 11mm super thin unibody Adjustable super bracket installing system Hanging kits is available (optional) Water-resistant cooling system UL approval power supply Two-year What's in the Box 1 x G2 Aqua Air 1200 Lighting Fixture (AA-1200 / 96W) 1 x Smart Controller 1 x Super Bracket 1 x US Standard Power Cord 1 x Power Adapter 1 x Tool Sets 1 x Printed Instructions Smart Controller The new Aqua Air comes with a variety of settings: clock, timer, LEDs channel, special effects (sunrise, sunset, thunderstorms), demo and factory reset. You can use the "demo" to check all the settings in 1 minute and you can reset your Aqua Air by choosing "factory reset". Furthermore, the Aqua Air has 3 LED-channels and can be set separately. It's including the channels of white, blue and special (UV, green, red, warm white). Any product you return must be in the same condition you received it and in the original packaging. The item "MicMol Smart LED Aquarium Light Aqua Air AA-1200 Marine 96W 4860 Programmab" is in sale since Thursday, May 24, 2018. This item is in the category "Pet Supplies\Fish & Aquariums\Lighting & Bulbs". The seller is "holidayjunction" and is located in New york, New york. This item can be shipped worldwide.